Located on Battle Acre at the Fort Fisher State Historic Site, this monument to Confederate soldiers is composed of a large bronzed clay eagle perched atop a tall granite column. The column, in Tuscan or simplified Doric style, stands approximately twenty-four feet high. The column rests on a large square base which itself sits on three shallow steps. The front face of the base contains a bronze plaque with the Battle of Fort Fisher depicted in bas-relief. A bronze plaque on the rear is inscribed with the dedication. One side is inscribed on the granite face with a commemoration of the Battle of Fort Fisher on December 24-25, 1864 and January 15, 1865. The other side is inscribed with a dedication to the Confederate soldiers who defended the fort. The eagle is depicted with its wings outstretched as it perches on a bronze sphere. The entire structure is mounted on a low rectangular brick platform with four shallow steps leading to the monument. This platform is not original to the installation of the monument. A small stone marker dedicated to "OUR UNKNOWN CONFEDERATE SOLDIER" is located in the brick in front of the monument. An historic black and white photograph shows this plaque located in the grass at some point. Front face, on bronze plaque: IN MEMORY OF THOSE MEN / OF THE CONFEDERATE STATES ARMY / WHO FOR MORE THAN THREE YEARS / MANNED THE GUNS OF FORT FISHER / UNDER COMMAND OF / COLONEL WILLIAM LAMB / MAJOR GENERAL W.H.C. WHITING / AND MAJOR JAMES REILLY. “South’s Numerous Monuments Cited: Mrs. Long at Unveiling Declares They Perpetuate Confederate Heroism,” Wilmington Morning Star, June 3, 1932. Butler, Douglas J. North Carolina Civil War Monuments: An Illustrated History (Jefferson, North Carolina: McFarland & Company, 2013). “Gov. Gardner Cites Valor Of Fort Fisher’s Heroes,” Wilmington Morning Star (Wilmington, NC), June 3, 1932, 1. The monument reportedly cost between $9,000 and $10,000. On the day of the dedication, the day before the anniversary of Jefferson Davis's birth, North Carolina Governor O. Max Gardner made the dedication speech. He spoke honoring the soldiers of the Confederacy and also praised the historic value of Fort Fisher as a strategic stronghold throughout the war. He commented that the difficult effort to hold the fort represented American strength. Mrs. Glenn Long, the president of the United Daughters of the Confederacy, also made a passionate speech on the importance of preserving Confederate heritage in the permanence of stone (SanCartier, p. 36). Many attended the dedication, including four veterans of the war, as well as many prominent members of the military and the United Daughters of the Confederacy. An invocation was delivered by the Reverend Thomas C. Darst. An article in the Wilmington Star the following day also reported on a number of uninvited guests: a number of local cows joined the festivities, mooing loudly. Apparently several months earlier one of the cows, named Bossie, chewed the rope on the nearby flagpole marking Battle Acre and pulled down "Old Glory." According to the article, one attendee commented that the cow had succeeded in doing what "the whole Confederacy couldn't do - lower the American flag" (Butler, p. 212). The unveiling had originally been planned for May 18; however, the Wilmington Chamber of Commerce apparently wanted to capitalize on attendance at the event to promote and coincide with the opening of the inland waterway and so donated $250 to the dedication event in exchange for changing the date (Butler, p. 211). The marker, built by Greensboro architect Charles C. Johnson, was raised by the United Daughters of the Confederacy. Construction of Fort Fisher began in 1861, and the fort remained in Confederate control until January 15, 1865 when Union forces captured the fort following an assault beginning on December 24-25, 1864. Fort Fisher was critical for supplying Confederate troops as far north as Richmond, with its connection to rail lines. In 1865 Wilmington was the only remaining supply route for the troops in Northern Virginia. In 1935 remains thought to be those of a Confederate soldier were found in the area and moved to the base of the monument. This is presumably the origin of the stone commemorating the Unknown Soldier that sits at the base of the monument. The monument is located just off Battle Acre Road near Fort Fisher Boulevard South (U.S. 421). It is located on the right side of the road when traveling south. The front of the monument, with the eagle facing forward, faces roughly eastward toward the ocean. The Cape Fear river can be seen in the distance behind the monument. The site is surrounded by grass. The monument was relocated somewhat further inland in 1948 to protect it from encroaching erosion on the ocean side of the peninsula. The entire site, with the 1921 Fort Fisher Monument, has been the location of Confederate Memorial Day observances and other monument ceremonies. 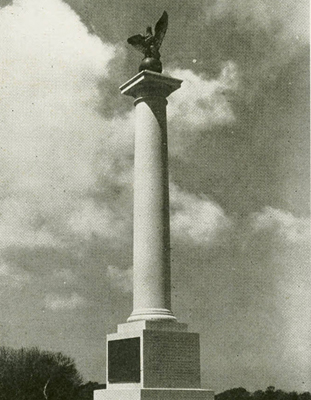 The United Daughters of the Confederacy began plans for the monument in 1929. The Fort Fisher Memorial Committee, lead by Mrs. Annie Rogers Newell from Charlotte, raised money collecting donations from local chapters and obtained the site. Apparently they had originally selected a site to the east along the ocean, given by Thomas and Louis Orrell, that subsequently succumbed to erosion before the monument could be installed. In 1929 the City of Wilmington had taken possession from the U.S. Lighthouse Service of the land where the fort's headquarters were believed to have stood, just inland to the west of the site selected by the Memorial Committee. The City was given the land known as Battle Acre with the requirement that it be preserved as the site of the fort. Battle Acre was dedicated on May 24, 1931 and displayed a flagpole and a number of small concrete markers. Mrs. Newell subsequently received permission from the City to erect the monument on Battle Acre.